This is a guest post by our Facebook Moderator, Shawn. 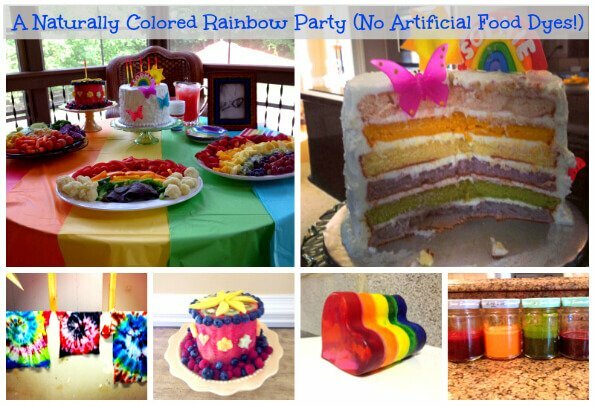 She recently put together a fabulous little “Rainbow Party” for her daughter’s birthday, and when I shared some of the photos on Facebook there was so much excitement that I asked her to share all the details with us here on the blog! 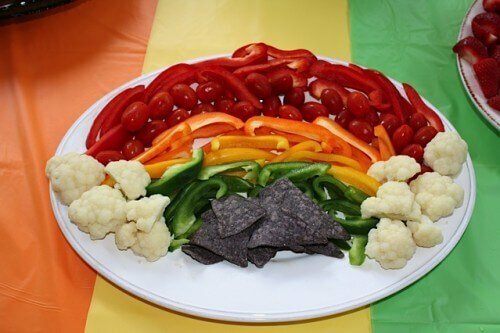 My daughter is my fruit and veggie lover, so I knew I wouldn’t get any complaints by serving up a rainbow of colors with healthy foods. 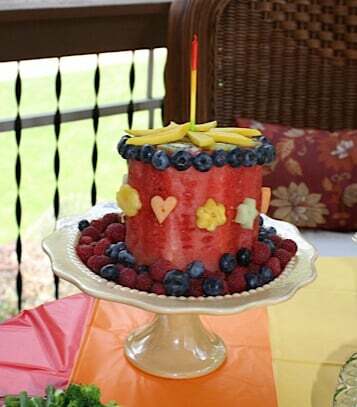 As we were looking for ideas on Pinterest, we came across a watermelon “cake.” She immediately fell in love! This is my child who asks me everyday when it is going to be “watermelon season.” She had her heart set on this cake, but I figured that if I didn’t at least have a “regular” cake her friends might not ever come back for another birthday party. So we had both. During the holidays I used my juicer to make a ton of pretty rainbow colored juices, which got me thinking. So I contacted a baker I’ve used in the past and asked if I could bring her naturally colored juices to use in a white cake she’d make for the party. She agreed, and I dusted off my juicer again and juiced a few carrots (for the orange) and spinach (for the green). I bought a can of beets and used the juice they were sitting in (for the red). I defrosted frozen blueberries (for the blue) and blackberries (for the purple), and put them through a mesh strainer. I had some turmeric on hand (for the yellow). She said she added the colors a teaspoon at a time until she got the right color on each one, and she also used this online tutorial for guidance. She made the rainbow and the sun out of fondant, and we didn’t eat those. My daughter had a string of butterfly lights in her room, so we borrowed a few for some added decoration. I even put a few drops of glitter glue on the non-edible butterflies to add some bling! The watermelon cake was honestly not the easiest, but my daughter really wanted one. This is a guest recipe by our team member, Shawn. Cut the ends off of the watermelon and stand it up on one end so that it doesn't roll around. Cut away the rind so there is no white left, and carefully carve the watermelon into a cake-like cylinder. Slice the kiwi into thin circles and place them around the top of the cake. Thinly slice a mango and fan out the pieces on top of the kiwi slices. Place the blueberries around the perimeter of the watermelon, using toothpicks to hold them in place. Slice the pineapple, cantaloupe, and honeydew into about 1/2" thick pieces. Cut these into fun shapes with cookie cutters and place them around the sides of the cake using toothpicks. For a nice presentation, place the finished watermelon cake onto a cake plate and surround with blueberries and raspberries. This can be made with a variety of fruits, depending on what is in season. I made two veggie platters because …well I just couldn’t help myself when I was buying all the vegetables. Again, feel free to use whatever veggies are available/in season or ones that you like. *To blanch any of these vegetables, bring a pot of water to a boil. Cook your vegetables for 3 minutes and then transfer to an ice bath immediately. Once cooled, remove from the ice water and lay on a clean towel to dry off. I blanched some of the veggies because my kids like them better that way – all my kids love broccoli, but won’t eat it raw. I wanted to use the food and activities as the main focus of the party, so I assigned each girl to wear a different color of the rainbow. The few things I purchased from Target were rainbow plates, napkins, cups, glittery hats, and solid colored plastic table cloths. I left the table cloths folded and placed them in order of the rainbow, and I used a “Happy Birthday” banner that we already owned. 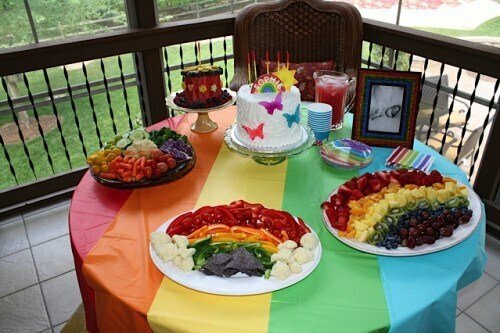 What do you do at a rainbow party? You craft! It is a favorite pastime at our house. I bought unfinished wooden frames for each guest and put out Mod Podge, paint brushes, and LOTS and lots of fabric, tissue paper and scrapbook paper cut into pieces. The girls painted the Mod Podge on the frame first and then placed whatever pieces of the scraps struck their fancy onto the frame. A lot of Mod Podge was painted on top of the scraps to make a pretty, unique picture frame. I bought each of the girls a canvas to paint, put out acrylic paint and paint brushes, and then let them go to town. Afterwards I kept all of the girls paintings and hung them in my daughter’s room to help her remember this birthday celebration with her friends. Last, we tie-dyed shirts. I bought each girl a white t-shirt and a tie dye kit. They picked out the design they wanted and we put the rubber bands on the shirts for them. The kits are really self-explanatory and helped with the instructions. The girls picked their colors and my husband did the dying since it would be pretty messy for 5 year-olds. I wrapped the shirts in a bag and they all took them home and washed them out the next day. I think they turned out great! I am big on being practical as far as party favors go. I find it a strange tradition to give out gifts to guests at a birthday party, but I am not going to be the one who stops it. The girls got to take home their shirts and their frames. I would normally think that this was plenty, but since I was feeling crafty I spray-painted cans with chalkboard paint. I bought water colors and Trader Joe’s Organic Fruit Strips to go inside the cans. I also made these cute little heart crayons. I have more crayons than the Crayola factory, so I had my daughter peel the papers off and break them into small pieces which she used to fill up silicon heart molds about half-way up. We placed the molds onto a cookie sheet and put it into an oven preheated to 200 degrees F. It took about 15 minutes for them to set, but I suggest you watch them very carefully. I used a toothpick to stir the wax a bit. When they are melted you can leave them on the counter to cool, but I was impatient so stuck them in the fridge. In the end the party was a huge success. 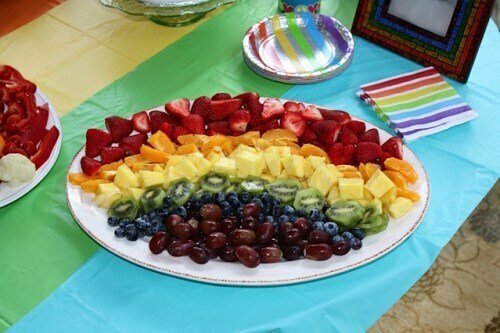 If you’ve had a rainbow party or have other ideas for “rainbow” foods or activities, we’d love for you to share them in the comments below! Shawn is part of our 100 Days of Real Food team, moderating Facebook comments. This is fabulous! I am an Organic Special Dietary Needs Chef and I LOVE seeing people search out the healthiest way to do things! Great jobs! WOW. I’m super duper impressed Shawn. Mom of the year goes to you – that looks like it took a lot of work – you go girl. Thank you! It was so much fun to do. I loved that no one complained about the food at all!! Whoa… I need a watermelon cake! Awesome job, Shawn! Both on the party and the write up! You are a Super Mom! I have been attempting a no-dye red velvet cake – and finally got a pretty good one using a beet puree powder. I made tri-colored noodles with spinach, beet, and a carrot-pumpkin mix. I’d love to send you some samples to play with if you’d like! Great ideas! I made a similar fruit platter for my son’s birthday, but made them int fruit kabobs with a shishkabob sticks. Jodean, that is a great idea!! I don’t have young children at home anymore, but my first grandchild was born today! I am determined to offer my grandchildren healthful food in an attractive way, so I love these fruit and veggie ideas. In fact, I plan on using those ideas for our work birthday parties, which often include a lot of food I don’t eat anymore. Thanks so much for these ideas! Congratulations!!! Your grandchildren are so lucky!! I find that it is a struggle to get the grandparents on board to feed their children healthy food. Elizabeth, you are a model to grandmothers all over the world. Thank you! Wow, that’s amazing! Way to go. Love everything!! Mother of the Year for you!! Have fun and let us know how it turns out!! Thank you! I like the muted colors better than the bright ones. It makes it more appetizing. That was absolutely gorgeous! So much effort, but birthday’s are that way, anyway. 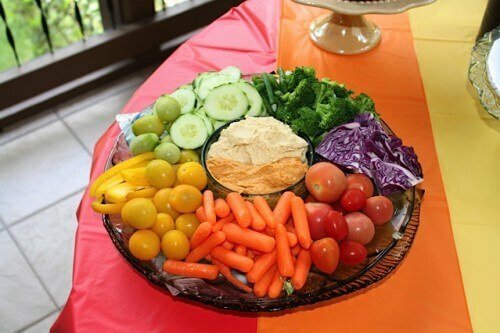 Super healthy and so beautiful! Great work! We have so many crayons we throw them away! Now I will recycle them! <3 and hats off to the baker! I have tried that and it is tough! Of coarse, we didn't have internet tutorials back then. ;) As mu kids would say: "I'll be using these ideas like a BOSS!!" :). I love to make these heart crayons. I should really get more shapes :). Such cute ideas! Sad to hear the watermelon cake was such a pain as that’s the one thing my sons would love. For the real cake, they’re all chocolate all the time! So I have to find some good options. Anita, give it a try!! You might find it easier than I did. Making the watermelon even all the way around is what I found difficult. I would suggest getting a big watermelon so you have some wiggle room. My watermelon was on the small side. Love the watermelon cake. It would make a fun summer treat too I’m thinking. We had a rainbow birthday party as well, but made it a “rainbow art party” since my daughter loves art. I posted pictures and info about what we did on my blog including our take on the rainbow art fruit platter and our experience with making a layer cake without artificial coloring (well, mostly). Natural colors do add some interesting flavors. One of my favorite parties we’ve done. Brenda, I checked out your party and you did a great job!! Loved the photo booth!! I love the tie dye kit, but I’d love to hear your thoughts on using this kit while camping… Too much? We are having a camping birthday party at a real campsite. What do you think? Would that be a good activity or would it be too much work? Amanda, I do think it would be a lot to do while camping. I would also suggest that you get some good latex gloves when you purchase the kit. How fun to do a camping party!! Have fun! I loved the concept of getting each child to dress in a different colour. A guest rainbow! Brilliant. Thank you!! I was a little apprehensive when I asked them to do this. I thought I would get some eye rolls from the parents. Everyone was happy to do it and it looked so cute!! I had my daughter in a white skirt and a white shirt with a rainbow peace sign. I am glad I asked because I was so happy with the results of the pictures! Very Nice Post….. I will share it on Google plus. Thank you a million for sharing this! I made a rainbow cake in the past and I have to tell you, the artificial food coloring I used to tint it looked no better than the natural ones you used. You are an inspiration. One look at that watermelon cake and all my kids wanted one. I promised to make one for my son who’s birthday is next in line. Thank you again. Your daughter is incredibly lucky to have such a caring and loving mother! Melissa, you are so sweet!! It sounds like your kids are just as lucky :). The watermelon cake was such a huge hit!! Good luck!! I made the rainbow cake for my son’s birithday (made it into a rocket ship shape). I got deeper colors by simmering the different juice dyes to consentrate the color. It worked very well, and the colors were much deeper and dramatic. I love the entire rainbow theme, doubt I can convince my boys, but if I ever have a girl . . . Thanks for the tip!! That is a really great idea!!! My boys wouldn’t go for it either, but they sure enjoyed it ;). LOVE this. Any ideas for naturally coloring icing? My daughter’s turning 2 this month, and wants a Dump Truck Cake – fully colored. Meg, you can try these dyes India tree natural food dyes: http://tinyurl.com/8mofg5v. Or play around with natural food dyes. Here is a post Lisa did on frosting and natural dyes: https://www.100daysofrealfood.com/2013/05/24/recipe-yellow-cupcakes-homemade-frosting-better-than-the-box/#more-8658. Good luck!! I whipped up unsweetened whip cream and added some consentrated (by simmering off some water) juices to make the colors for my son’s rocketship cake. Need to really concentrate the colors to prevent from making the whipped cream watery. Fantastic ideas!! My daughter’s second birthday is this week and she’s having a Minnie birthday. She could eat her weight in fruit in any given day so I’m definitely planning on doing a watermelon cake! Great Kim!! I hope she loves the watermelon cake as much as Sophie did!! What lovely ideas! Our new baby boy will be christened later this year and I’ve just started thinking of ideas for the catering as the party will be at our house. I’m very conscious of providing healthy choices for the children and you’ve now given me ideas to make the food table look lovely and colourful. So glad I found this, thank you! Someone said earlier today that they did this cake for a Noah’s Ark theme. Congratulations on your new baby!!! Everything looks so great! I’m wondering whether you can taste the juice flavors in the cake and if so, did anyone mind them? Thank you!! You could not taste the juice flavors. I have done all of them in frosting before and no one could taste those either. i was wondering the same thing.. do you taste the flavors.. i threw out all our food coloring..now i feel i can’t make cakes.. unless chocolate or white.. so i dont’ want to taste the flavors..
A couple of years ago I tried baking a rainbow cake for my little one’s 7th birthday using store bought natural dyes by India Tree and it was a total failure – the colors that looked so vivid before baking came out looking all the same brownish shade. I had to make another cake just hours before the party (plain chocolate this time). The India Tree colors work well in frosting, whipped cream and pancakes (for a rainbow stack for Fat Tuesday! with matching colors fruits and veggies on the side). Love the website– lots of great ideas, info and recipes!! As the family baker and the grandmother of a granddaughter with artificial food dye sensitivities, I especially like this post. I often use the India Tree Natural Dyes and Sprinkles. ( unfortunately they are quite expensive and you really can’t get very vivid colors with them) Chocolate and pureed strawberries and other berries also work well for flavoring and coloring frostings. Naturalcandystore.com has organic/ artificial dye free candies that are great for decorating. The last 3 birthday cakes I have made are: a volcano cake for a dinosaur theme, an under the sea themed cake with a shark’s fin on top and a Peace themed cake. I’d love to share photos of the cakes if permitted and if someone could instruct me on how to post them ( hey–this grandma isn’t that tech savvy- ha). Those cakes turned out so cute!! I saw them, so you must have some techy in you ;). Thank you for sharing them. Your family is really lucky to have you so dedicated into making such beautiful cakes that they can eat safely! Thanks Shawn. Looks like your daughter had a great birthday party! My granddaughter loves watermelon as well– might have to try making your watermelon cake for the 4th of July– very unique and fun. This looks really very pretty! It’s artistic too. It’s great of you to make your daughter a watermelon cake knowing that it would never be that easy to make one. Your daughter is the luckiest, she has a cool mom. Hi Shawn, I’m having a color and paint 3rd birthday party for my son and I love, love the idea of tie-dying t-shirts. Where did you order the white t-shirts from? I’d love to get a 3T size if possible and haven’t been able to find them online yet. Thanks for the additional tip! I left a comment on some of the activities we did when my daughter turned five for a rainbow artist party. Have you seen how you can get a tye-dye effect using sharpies and rubbing alcohol? That might be fun for 3 year olds. Can you use the juices to color icing? Yes, I have used these to color icing. Make sure what ever recipe you are using that you use the juices instead of the liquid it calls for. Hot tub heaters keep the water clean and free from bacteria, algae, mold and yeast on grains and produce. To save even more money on hot tubs hot springs the product and on shipping and handling. Yes!! I freeze them all the time. Will freezing the cake layers effect the intensity of the colour do you think? ie cause it to fade? I want to make them ahead so I can just assemble on the day? I don’t think it would cause it to fade, but I have not tried it before. Let us know if you do it. Thank you for this post! My daughter wants a rainbow cake for her birthday party this weekend and while I don’t mind bending the rules on whole foods now and then, I’m pretty sure she is sensitive to food dyes and I know my nephew is, so that’s one rule I want to keep intact. I’m excited to try this cake and after seeing this post my mom is excited to assemble rainbow fruit and veggie platters to accompany it. Also I made a watermelon cake for my 8 year old’s birthday last year and it was a hit! I frosted the watermelon cylinder with lightly sweetened whipped cream before decorating with other fruit so it really looked like a cake, and the whipped cream helped even her junk-food junkie friends enjoy the fruit. I didn’t make a second cake, but instead let the finger cookies, mini scones and lemon curd we served be the sweets. (It was a tea party.) So fun! The cake looks great! Did the colors affect the flavor? (I’m assuming you wouldn’t want a beet-and-turmeric flavored cake, LOL). I had a “Little Artist Party” when my daughter turned five which was rainbow themed. We did rainbow “splat” painting (big hit), handprint and footprint pictures, pin the brush on the artist (where they won rainbow sticker sheets), strung rainbow colored pasta on string for necklaces, and made rainbow-colored rice art. We had big bowls of fruit (one for each color of the rainbow), and rainbow-colored giant hanging pompoms made of tissue paper. It was great! Both girls and boys loved it. We made the dyed paint, pasta, and rice ourselves. They also decorated their own take-home bag using a rainbow stamp pad, large paper grocery store bags, and a sheet printed out with their names in rainbow colors. We also had rainbow colored aprons that I found online. The kids were so cute in them! Plus, with all the messy projects, it helped keep their nice clothes clean. I just saw this post on your Fb wall. This past weekend I had tried making pink cupcakes with beet juice from beets we had cooked for supper. We even let the juice boil after to try to reduce it. It looked like it was changing the cakes color but when we cooked them the cupcakes came out pure white as if we had not made any changes. Just wondering how you got it to work or if you have tried this before.? I have made red Valvet with beer purÃ©e and green ones at st Patrick’s with spinach before! Would be happy to hear yor tips! It sounds like you tried to use “juice” that you got from just cooking the beets in it, maybe colored water after cooking? I use an actual Juicer, a machine for just juicing fruits and vegetables, to get the beet juice I use for coloring and I get intense color from the very concentrated juice. I made a rainbow ice cream cake by putting fruit in a food processor and mixing with homemade whip cream. It was really pretty and yummy! This post makes me SO happy! 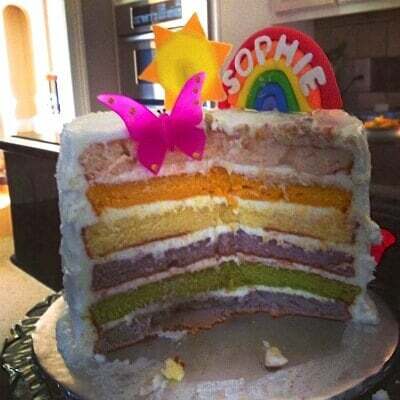 I am planning a rainbow party for my twin girls 4th birthday later this month and was a little concerned about how to make that cute rainbow layer cake. Thanks for the tips! Everything turned out really cute. So thankful for this post! 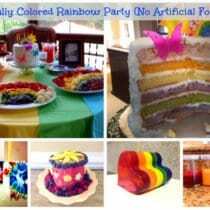 I have a little girl who will be 6 in November who has been asking about a rainbow party, since her last birthday! She is extremely sensitive to dyes so I was wondering how I was going to do this! Last birthday she wanted a pink cake (red is the worst!) So i used raspberry juice & it turned out pretty well. Thankful for the other ideas too!!! Thank you so much for sharing this link! Fruit juice is awesome alternative to food dye!! Do you know how aggravating it is to have to X out of that? Especially those with who want to view by their smart phone? Please put an option on the side and give folks a choice please. Other than that, the recipes are fantastic. Love this. Any more specific instructions/ratios on how to use juices for coloring cakes and frosting? The rainbow cake looks lovely, but it looks like the red layer is more of a pale pink. I tried to use pomegranate juice in frosting before and could only get to a pale pink – despite a lot of juice – which gets tricky with consistency. Never tried beets but worried about taste if I want a deep red color. This year I ended up using white frosting on my cake and then covering with freshly diced strawberries in the pattern I wanted. That worked better than the pomegranate juice. Now my almost 3 year old is requesting a purple cake. So how exactly do I make this happen with blackberries/blueberries and a mesh strainer? Thanks! your Fruit Platter recipe i have try at my home.i like it.thank you for sharing this nice recipe post. My kids loved Watermelon cake. I tried this one one of my son’s 6th birthday. It was good. Thanks, Shawn! !